Emma Lawton is finally able to write her name again. The 33-year-old graphic designer was diagnosed with Parkinson's disease back in 2013. It's a progressive movement disorder that took away her ability to draw and write -- until now. It's all thanks to a wearable with her namesake designed by Microsoft researcher, Haiyan Zhang, who was inspired to help Lawton after the two met in London. The device pairs with a tablet that controls the wearable's vibrations. Something about the vibrations is enough to block the feedback loop between Lawton's hand and brain, easing her tremors and allowing her to write and draw once again. Haiyan Zhang and Emma Lawton show off the Emma Watch during Microsoft's Build event in Seattle, Washington, on May 10, 2017. It's now been almost a year since Lawton began wearing the device, and it seems to be working well. "It's still a surprise to me when my handwriting comes out the other side of it. The device doesn't stop my tremor. It gives me some control there. The writing, it’s not going to be perfect. But, my God, it’s better," she said in a blog post. A sample of Lawton's handwriting with (right) and without (left) the watch. Encouraged by the success, Zhang has partnered with a neuroscience team in London to set up trails for the device. 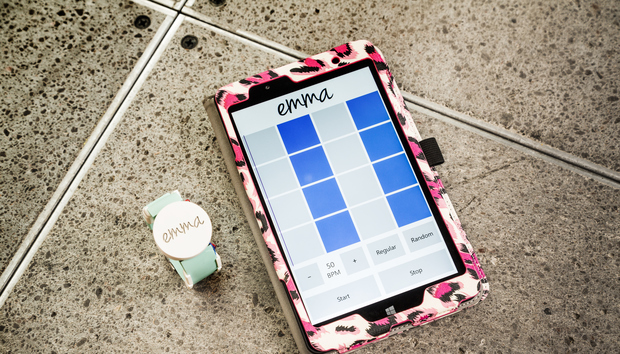 She hopes the Emma Watch can help improve the lives of other people suffering from Parkinson's disease.